After a storage device has been configured, configure a subclient to define the data that will be backed up. Subclients are logical containers that define the specific data that will be protected (drives, folders, files, databases, mailboxes.) During installation of some agents, a default backup set is automatically created, which contains a default subclient. The default subclient is designed to act as a catch all, automatically detecting and protecting all data the agent is responsible to protect. Additional subclients can be configured to define content and how it will be protected. For more information about subclients, see Subclients Overview. Use this procedure to create a subclient named "Test_Subclient" to perform your first backup. From the CommCell Browser, expand Client Computers > client> Agent. Right-click the defaultBackupSet, point to All Tasks and then click New Subclient. The default subclient is automatically created when you install the software. The content of the default subclient includes all of the data in the computer. When you create a user-defined subclient, the contents of the user-defined subclient are automatically removed from the default subclient content. On the General tab, in the Subclientname box, type a name for the subclient. Note: In this example, we will use Test_Subclient. On the Content tab, click Browse. Navigate through the list of folders to select the files and folders that you want to include in the backup. In this example, we will include the My Documents folder as the subclient content. Select My Documents and then click Add. Click Close to close the Browsing content for dialog box. To create a storage policy, click the Storage Device tab and then click Create Storage Policy. In the What will this storage policy be used for? dialog box, click Data Protection and Archiving and then click Next. 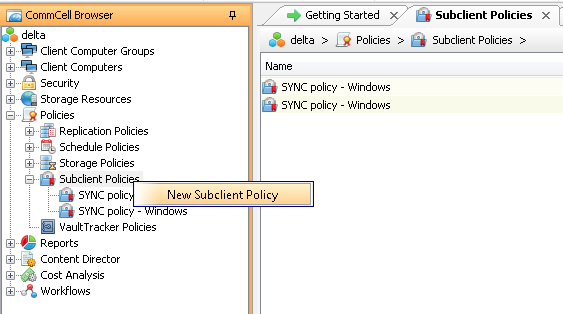 In the Enter the storage policy name dialog box, type the name of the Storage Policy in the Storage Policy Name box. In this example, we will use Test_Storage_Policy. In the Select a default library for this primary copy dialog box, select a disk or tape library from the list. Note: The disk or tape library was configured previously. See Commvault Software Quick Start Guide - Configure a Storage Device. In the Select a MediaAgent for this copy dialog box, select a MediaAgent from the list. In the Enter the streams and retention criteria for this policy dialog box, click Next. Select the Software Encryption option to enable encryption on copies including the primary copy. In the Do you want to enable Deduplication for the primary copy dialog box, select Yes and click Next. In the Specify the location to store the Deduplication Store dialog box, select a MediaAgent from the MediaAgent Name list. In the Location box, type the path name where the deduplication database must be located or click Browse button to select the folder. In the Review your selections dialog box, confirm the details and then click Finish. In the Subclient Properties dialog box, click OK. In the Backup Schedule dialog box, select Do Not Schedule and then click OK. The new subclient appears under the defaultBackupSet in the CommCell Browser. Now that you have configured a subclient, we recommend that you perform a backup operation to gain an understanding of the process. See Quick Start Guide - Back Up Data.